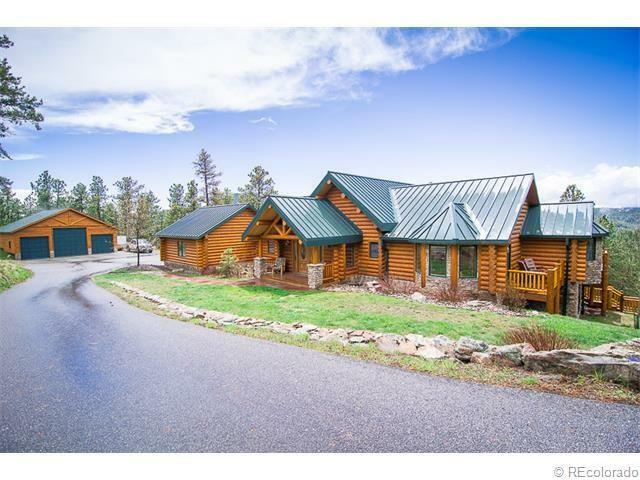 Colorado log homes and cabins seem to be the dream of many who are considering purchasing a home in the high country. The interest in Green Building along with the pioneer romance of huge logs rising up out of the earth give buyers and owners a sense of permanence, strength and natural beauty. Construction, ownership and maintenance of these iconic homes require a thorough understanding, planning, commitment, and patience when making the Log Home Choice. Log Homes tend to cost more per square foot than standard cedar siding frequently found in the high country. It just costs more to build these homes - more labor, unusual building materials and supplies, dormers, gables and roof lines that we expect in a log home cost as much as 15% - 20% more than typical home construction. Log Homes appear to have large square footage numbers. But, keep in mind that builders and assessor frequently measure from exterior walls. Logs are huge, sometimes as much as 3 feet in diameter, therefore cutting into the net square footage of a home. Logs will shrink, twist, and crack after installation. Your builder may fill the log cracks with compounds, but you will have to maintain the exterior and interior as often as every year. These issues are actually preferred by most log home owners and it does add a more authentic appearance to your home. Electrical, plumbing and heating systems are more challenging to install. Electricians will use more wiring to weave in, around and through logs. Gas, forced air heating and cooling systems frequently impact the interior presentation in a log home. Radiant heat, hot-water heating systems are far more common, easier to install, and provide the open, vaulted ceilings that buyers and owner prefer in the log home. Air conditioning is even more challenging. With radiant or hot water heat, there is no ductwork for air conditioning, so many rely on ceiling fans, or electric systems that cool homes room by room. Log homes, even in the high country, account for a very small percentage of homes. Appraisers, insurance companies, and lenders will need to be informed of your choice when building or buying a log home. Replacement costs will be higher if you are the victim of fire. Fortunately, the value of your home will be greater than others in a normal market because style, quality, and construction methods will be unique. There are options to the full logs. Consider half log applications to standard construction or milled, laminated log for an exterior. The look is equally beautiful, requires a little more maintenance, but considerably less expensive. Remember to have your exterior wood frequently stained or protected with clear coating in order to maintain the look against our strong exposure to sun here in the high country. Log home kits have had a history of unsatisfied owners. The construction is challenging and building inspectors expect equal if not higher standards for occupancy. Proper and durable compounds for sealing windows and doors, proper and adequate installation of HVAC systems, proper materials, structural standards, etc. have caused numerous consumer claims, so be cautious and methodical in interviewing experienced contractors. Demand history of your contractors experience, check with county building departments for incomplete permits on those homes, and talk with owners in your community.